St Mary Magdalene Academy is a new primary and secondary school in Holloway, north London, which opened in its state of the art building in September 2008. The Academy is sponsored by the London Diocesan Board for Schools, the educational arm of the Church of England in London. 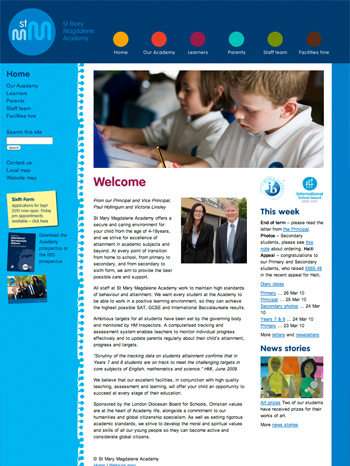 I’ve produced two websites for the Academy; the newly designed version (seen on the right) went online in September 2009 and runs in Expression Engine, the popular content management system. I’m especially pleased with the site structure, which was worked out in discussion with the Academy communications team. Many school websites have confused structures, and I think ours enables parents, students and staff to find what they’re looking for quickly. I was also fortunate in that the Academy liked the idea of a playful design. The site is updated almost every day during term time, with news stories and photos from students, letters for parents from staff members, job ads and document updates. This constant activity gives the site its fresh, up to the minute feel.